I bought this chair to fit in living room/great room with a en eclectic coastal and rustic decor. It looks great and exactly like the picture and was well packaged for shipping. The cushion fabric is an oatmeal colored fabric. Looks great! I received my two chairs several weeks ago and am pleased but not ecstatic. They look very chic and add a level of coastal sophistication to the room. I had hoped to use them in the living room however the chairs are somewhat wobbly, ..giving me the impression that with any type of frequent use, they will eventually become looser and looser and require professional attention. I have relagated them to the MBR hoping that they will last longer there. The seat cushions are very unforgiving, while not uncomfortable once in the seat, they are very hard and take some getting used to. 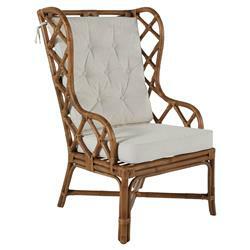 The Watson brings a twist on a traditional wing backed chair with clean geometric shapes and antique finished rattan. This chair’s dramatic design features a tufted linen back cushion, and a welted linen seat cushion. Its stately height and curved arms make the Watson chair an eye catching piece. Use as dining arm chairs or as occasional reading chairs.